Powerful yet understated, these earrings convey a strong message with minimalistic grace. Silhouettes of the budded cross (which also goes by the name "apostle's cross") are cast in 14K yellow gold and given a brushed finish that's subdued, subtle and classy. The cross depicted by this pair is set apart from other crosses by the three "buds" found on each arm, and these design elements have had a number of meanings throughout the centuries. Whether you think that they represent the trinity or a faith that is growing, these simple earrings will allow you to send a gentle message about what you believe. Cross earrings measure 11mm x 8mm and come with standard push back posts. 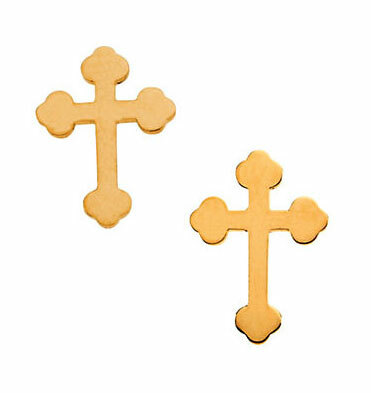 We guarantee our Budded Cross Stud Earrings, 14K Yellow Gold to be high quality, authentic jewelry, as described above.